Can you provide complete routing information for connecting all 3 products? If I have multiple MK products, does each one gets its own Target? On the product page for MK Connect it says “All your products can share the same connection to MK Connect”. If each product gets its own MIDI connection, then how is this possible? Why does MK Connect provide connections for multiple tablets? I’ve tried and tried and read all your documents. I made the connections as you suggest but it’s still not working. What do I do? Why can’t I interact with the controller in the Lemur Editor? Why doesn’t my tablet appear in the list of available devices in the Lemur Editor’s Connections window. What is the difference between a WiFi connection and a hardware connection? I’m suffering from WiFi droputs. Any advice? Can you help me set up the iConnectMIDI? If I’m using the iConnect do I have to also use the Lemur Daemon/LoopBE30? Do I have to install MK Connect on my tablet as well? My MK Product says “Disconnected” in the logo, what is going on? Do I have to be connected to MK Connect all the time? I’ve spent a lot of time creating my customized presets. How do I back up my work to my computer? Why do some files have the extension “.jzml” and some “.jzlib”? What’s the difference? How do I move C_brains into the same project as Composer Tools Pro (or vice-versa)? How do I resize the controller? In C_brains/Composer Tools Pro I see that I can send my Utility Buttons on ANY Lemur Target. Should I send Composer Tools’ Utility Buttons to Composer Tools’ Target, and C_brains’ Utility Buttons to C_brains’ Target? Is it a bad idea to send Utility Buttons on the same Target as C_brains? Will I accidentally trigger a C_brains macro? As you can see there are numerous ways to connect Lemur. Lemur provides 8 independent, bidirectional streams of MIDI called “Targets”. You simply assign your controls to one of the Targets and then hook up a virtual MIDI connection. Correct. You wouldn’t want MIDI meant for Composer Tools to be sent to a destination meant for C_brains, just like you wouldn’t want one of your vocal tracks to be sent to your guitar mix. Each product gets 2 targets: a “main” Target, and a Target to MK Connect. Only the Target to MK Connect is shared. MK Connect knows how to differentiate between the different products. It doesn’t matter if the MIDI data gets mixed because MK Connect knows how to work it out. We wouldn’t want you to waste 3 Lemur Targets just to provide licensing information for 3 products! MK Connect will work out which products are authorized and send the license info back to the appropriate product. If you are using multiple tablets you must hook up different MIDI connections. This is a limitation of MIDI itself. When you connect a MIDI connection between MK Connect and a tablet, they own that MIDI connection. If you need to connect another tablet you will need to use another MIDI connection. Hold the “E” key on your computer keyboard while you click. This will put the Editor into touch-emulation mode. For more information about the Lemur Editor, please refer to the Lemur User Guide, chapters 1-8. Check to make sure that your tablet is on the same network as your computer and is discoverable. Once it is, it will automatically appear in this list. WiFi is cheap and/or free and provides tremendous convenience, while hardware (like the iConnectMIDI) provides much more stability. If you are a DJ and rely on a solid connection for a live show you wouldn’t want a sudden WiFi dropout to stop the party. For most people the two are not much different. If you suffer from WiFi dropouts unfortunately there’s not much advice MIDI Kinetics can offer. Networking is a complicated subject with many factors involved and we certainly aren’t experts. In our studio, we use a basic WiFi connection 99% of the time. Our WiFi router is downstairs next to the TV, but our computers are in a spare room upstairs, and the studio is next to it. Getting a WiFi signal from the tablets in the studio upstairs, downstairs to the router, then back upstairs to the computer room just wasn’t working. We didn’t want to run Ethernet cables through the walls and we didn’t want to bother with setting up another local WiFi network. The solution for us was a Powerline Adapter. They are very cheap and work like magic. The Powerline allowed us to plug an Ethernet cable directly from the router to the computers without running cables through the walls. This bypassed the air gap between the router downstairs and the computers upstairs. Our network is now basically 99% stable and we have near zero downtime. This is a tough box to set up. Unfortunately, we only have experience with the iConnectMIDI4+. Since this is not our product we don’t offer direct support for it. 1 or 2 iPads connected using iConnectivity’s proprietary Thunderbolt/USB cable to the 2 front jacks (bidirectional). A USB MIDI keyboard connected to the rear USB jack (unidirectional). The iConnect connected via USB to the computer. No. There’s no harm in installing it though. It’s always good to have WiFi MIDI ports available. Keep in mind though that even if you don’t use WiFi MIDI ports, you will still at some point need a WiFi connection to transfer projects from the Editor to the app. You can also transfer Lemur projects via iTunes, but we ourselves have never had to do this. No, MK Connect is a macOS/Windows app only. There is no iOS/Android app. You set the correct Target for MK Connect but connected it to the wrong MIDI port. You set the correct MIDI port but connected it to the wrong Target. You set the Target and MIDI port correctly, but your MIDI device isn’t configured correctly. If you use WiFi, perhaps WiFi isn’t working. If you use a hardware box, then the hardware isn’t configured correctly and no MIDI is flowing through the box. Go through some basic troubleshooting steps isolating each component one at a time. First, check to make sure that you have set MK Connect to the desired Lemur Target, and that the Lemur Target is connected to the desired MIDI port. Next, rule out any issues with your physical/virtual MIDI connections. If you are using a hardware box like the iConnectMIDI make sure that the box is working. Yes, you might. C_brains tries to prevent you from doing this. Generally, it is not a good idea. If you open the Generic Remotes for C_brains you will see all the MIDI assignments for every macro. You could pick a MIDI message that isn’t used. This isn’t advised, however, because in the future MIDI Kinetics may add new commands. To be safe, pick another Target for your custom commands. Yes, but remember: MK Connect transmits license information via MIDI. If you for some reason you lose MIDI connection to MK Connect, you’ve also probably lost all your other MIDI connections. Maybe a cable became unplugged, or the WiFi signal dropped. MK Connect is designed to be as transparent as possible. Just set it to an available MIDI port and forget about it. 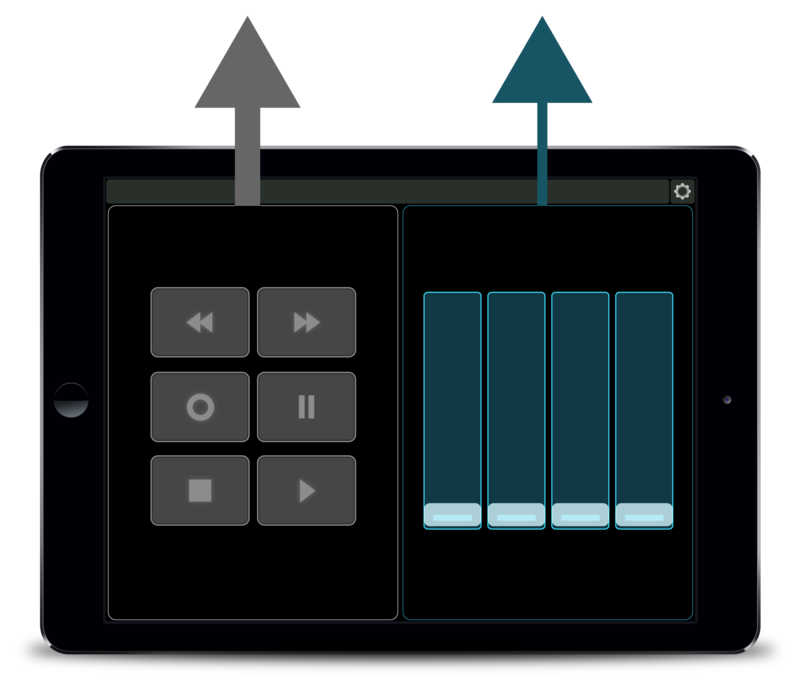 The Lemur Editor is capable of bidirectional WiFi communication with the Lemur app on your tablet. When you press “Connect” you send what’s in the Editor to the app. When you press “Download” you send what’s in the app to the Editor. So, to back up your work to your computer, just download. Word of caution: whatever’s currently in the Editor will be overwritten. Save first! Open the Lemur Editor on your mac/PC. Click the Connections triangle in the top right of the Editor. The Editor shows you a list of all the available tablets in your studio currently running the Lemur app. If you don’t see it, either you aren’t running the Lemur app, or the Editor can’t find your tablet on the network. Select the tablet you want, and press “Download”. Save the Editor project to your hard drive. jzml files are standalone Lemur project files. You can double-click them and they will open a new project in the Editor. jzlib files are little Lemur modules that can be exported and imported into existing Lemur project files. To be clear: “standalone” does NOT mean you can’t run multiple MK products in a single Lemur project. You absolutely can. You can copy/paste the contents of one jzml file into another. Composer Tools Pro and C_brains ship as jzml files. When you double click the file, they will open a new project in the Lemur Editor. Indeed, we could have just as easily shipped them as jzlib files. MK Transport, on the other hand, ships as a jzlib file. It works like a little Lemur plugin that you drop into other projects. For this product, a jzlib was a more natural choice. When you export banks from Composer Tools Pro you export jzlib files. For more information on exporting and importing presets, see the Composer Tools Pro Knowledgebase. When you transfer your settings to a new version you export them as jzlib files. Open C_brains in the Editor. Select the outermost “C_brains” container. Press copy (CMD/CTL + C) to copy it to your clipboard. Press paste (CMD/CTL + V). Drag the outer container and the project will resize the contents. That depends. What are you using them for? Utility Buttons just send MIDI data…what do you want to do with that data? Where should it end up? Composer Tools Pro is primarily a virtual instrument controller. You use it for all your performance data: keyswitches, CCs, pitch-bend, etc. You record it onto your tracks because it’s part of the musical performance itself. C_brains is primarily a control surface. It triggers productivity key command and macros in the background which help you control the DAW. You never want this MIDI data to get recorded onto your tracks. Most people use Utility Buttons for additional key commands and macros; perhaps there is a key command you love which isn’t included with C_brains’ basic set. You can easily set one up using a Utility Button. In this case, you wouldn’t want to send it on the same Target as Composer Tools Pro because you wouldn’t want to record it onto your tracks. Pick a new Target for your custom macros. That said, it’s perfectly reasonable (albeit less common) to use Utility Buttons for performance controls. Perhaps you want to have a button that acts like a MIDI “reset” which sends CC11 (Expression) at some default value. In that case, it becomes part of the musical performance itself and you should send it on the same Target as Composer Tools Pro. P.S. Composer Tools Pro has a very sophisticated controller reset mechanism built-in called the “Send Defaults Button”. Check the manual for info.